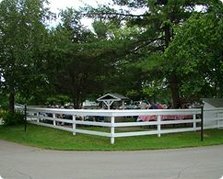 On 10 acres of beautifully landscaped grounds in the heart of Gananoque, guests of the Colonial Resort and Spa find this motel-style accommodation to be a friendly, relaxing and a welcoming place to spend their vacation in the 1,000 Islands. The Colonial Resort & Spa is known for its family atmosphere, good value and amenities. It features 54 comfortable, non-smoking overnight and pet friendly rooms – but the recreational opportunities set it apart. 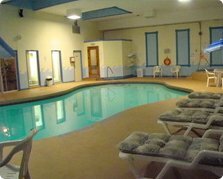 With a 200-seat restaurant, Harp & Heather Pub, health club, on-site spa services, outdoor recreation, including an indoor heated pool, hot tub, shuffleboards, walking trail, tennis court, horseshoes, conferences/meetings facilities, and more, the resort caters to every desire. 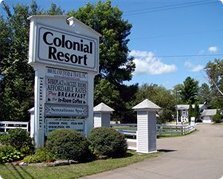 In addition to specializing in motorcoach group tour packages for overnight or multi-night stays, the Colonial Resort & Spa is a family vacation centre offering 1000 Islands getaway packages that include dinner, breakfast, various area attractions and spa services.